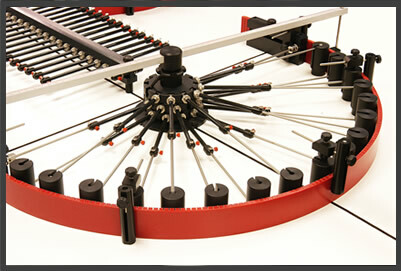 The unique tri-rotational technology of the Form8tor® allows up to 8 bends to be produced at any one time, increasing productivity and profit levels. The flexibility of the Form8tor® satisfies all markets - from repetition orders for new build or static caravans, straightforward arches for residential doorways, bespoke designs for conservatories or gothic/arabic designs for church restorations and numerous others. All components are made from durable and lightweight materials that are interchangeable creating a simplified manufacturing operation. The Form8tor® has a unique surface design, which incorporates six separate adjustable segments that guarantee a flawless horizontal flat bed. When combined with the universal components of the Form8tor®, the segments also provide an unlimited surface space for larger dimensions and repetitive bends. Designed to suit everyone's requirements, the Form8tor® fits into a compact area that only requires 6M x 6M of floor space.